Just one week after our new retinoblastoma awareness poster launched, the supporting You Tube film received more than 50,000 hits. This is by far the most successful awareness campaign CHECT has run to date. Created by Wunderman a digital merketing agaency based in London. 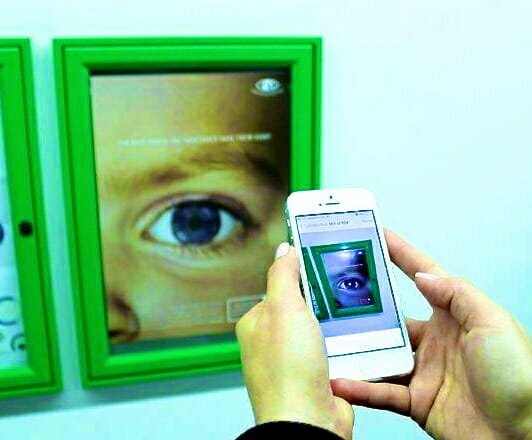 The film explains the thinking behind their innovative poster design which aims to teach people how to spot a potential sign of childhood eye cancer in a child’s eye, using a special reflective ink to demonstrate how cancer can reflect back in flash photography. Getting the balance right with awareness raising can be tricky – retinoblastoma is rare, with 1:20,000 children affected, but the signs can be relatively easy to notice. Ask any parent of a child with Rb if they wish they’d known what to look out for before their child was diagnosed and they will always tell you, absolutely, yes, as even the slightest delay in treatment could make all the difference. But because retinoblastoma is rare, it can sometimes be challenging to grab the attention of parents and health professionals when they are bombarded with so much other information on more common conditions. Spotting white eye in a photo can be a sign that there is something to be concerned about – but retinoblastoma is rare and it could also be just a reflection of the light on the back of the eye. Our advice is ALWAYS get it checked to rule out anything serious but we are mindful about getting the important message out without causing unnecessary panic. We believe this has been achieved with the new poster, to great results, and look forward to getting more posters out there over the next few months. We’d love to hear what you think about the campaign. You can you the comment boxes below to share your thoughts. Did you know that retinoblastoma is not the only eye condition which can show as a glow in the eye? Cataracts and Coats are just two of several conditions which could cause white eye, sometimes known as a white reflex . Find out more on our website HERE. If you have seen anything unusual in a child’s eye, make sure you get it checked by a health professional to rule out Rb and take a minute to know the six signs of Rb HERE. CHECT is the current adopted charity of Wunderman. We are extremely grateful to the Wunderman team for offering their expertise and staff time free of charge.